On 16 July, Chinese Ambassador Liu Xiaoming met with Vice-Chancellor of the University of Cambridge Sir Leszek Borysiewicz, They exchanged views on deepening exchanges and cooperation between China and the University. 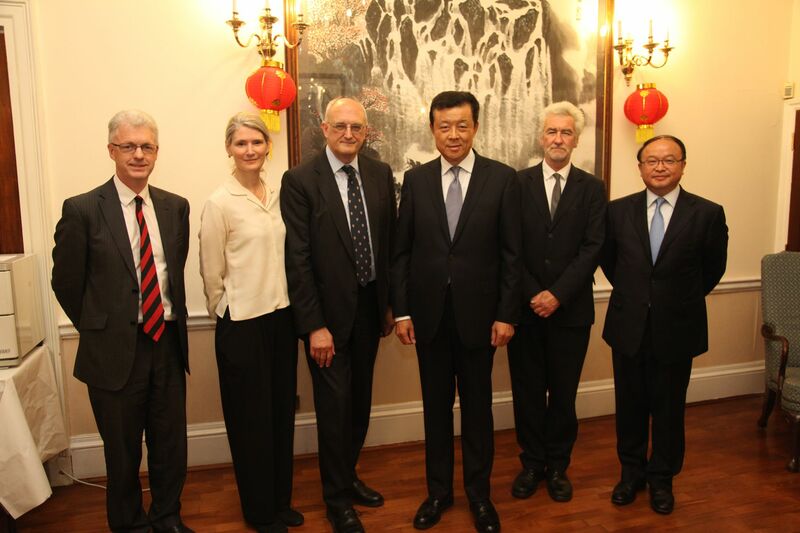 Deputy Vice-Chancellor of the University of Cambridge Ian White, Pro-Vice-Chancellor for International Strategy Dr Jennifer Barnes, Professor Peter Nolan, and Minister-Counselor of the Education Section of the Chinese Embassy Shen Yang were present at the meeting. Ambassador Liu noted that as a world-renowned university with outstanding teaching and research capability, Cambridge has cooperated with China over many years and produced a large pool of talents. At present the China-UK relations face major opportunities and enjoy broad prospects of development. President Xi Jinping's state visit to the UK in October will usher in a 'golden time' of China-UK relations. He hoped that Cambridge will seize the opportunity to deepen cooperation with China, and make more breakthroughs and innovation in academic research, personnel training and cultural exchanges. Vice-Chancellor Sir Leszek Borysiewicz and other leading staff of the University said Cambridge has always attached great importance to exchanges with China and has benefited greatly from these exchanges. The University will further strengthen cooperation with Chinese universities, research institutions and enterprises to make the exchanges in education, science and technology, and culture more productive.